The other day, my friend gave us some mini bread that she made for which, according to her, there was no need to kneed. I am pretty clueless about bread making as I have never made or baked any bread before. I always imagined that it's sure to be labor intense! I would say that the bread was very tasty and Nikolai must have thought so too as he requested I include some in his lunchbox for the next day. I love Keroppi and I tried to figure out what can I use for his green face with bread. I was lucky when I found some toppers at Bento USA with a reasonable price for a set of four toppers which even came with Hello Kitty in the set (my personal favorite)!! 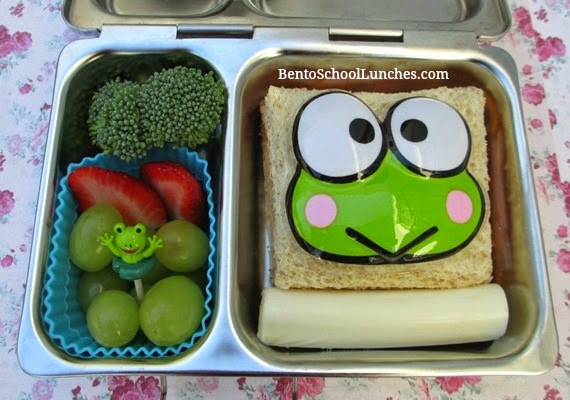 Here is the first bento with a Keroppi topper. I just had to remove the bread crust, and the topper added an instant cuteness. His sides were mozzarella sting cheese, organic broccoli florets and strawberry slices, green grapes and a cute frog pick. 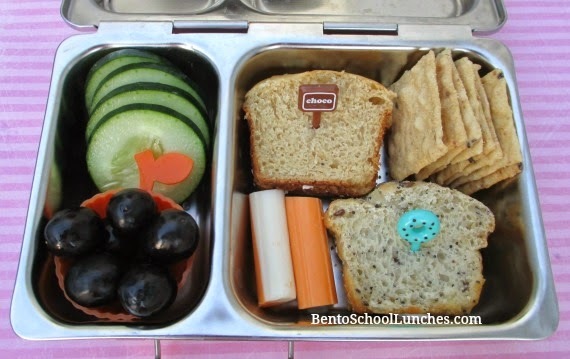 The second bento lunch is the mini bread with organic cream cheese and jam. He also had wheat thins, string cheese cut into half, cucumber slices and seedless black grapes. Both of these lunches were packed in his Planetbox shuttle. Those bread looks very good and I love the Keroppi toppers. Very cute! Love the Keroppi topper!